This template is a variation of style number three using the same type of section headings that have the over and under border lines and bold face fonts. The layout of this style can also help make a resume look more impressive by the way it evenly distributes the information throughout the page. So even if the quantity of information is lacking the page won't appear to be as empty as other more compact styles. This design is good for freshers, job seekers who are new to the workforce. The name is bold and centered at the top, it has a larger, bold font. Below it the address is on the left and the email and phone numbers are on the right. Next we find the balance of the information, it is lined up from the left side. The heading border lines fill the full width of the page with the heading titles between them on the left. The heading titles are written with a font size that is larger than the remaining text. The arrangement of the sections can be set by the user. The user can modify the font, colors, arrangement and styles. Customization options abound to turn this free freshers template into an awesome resume. 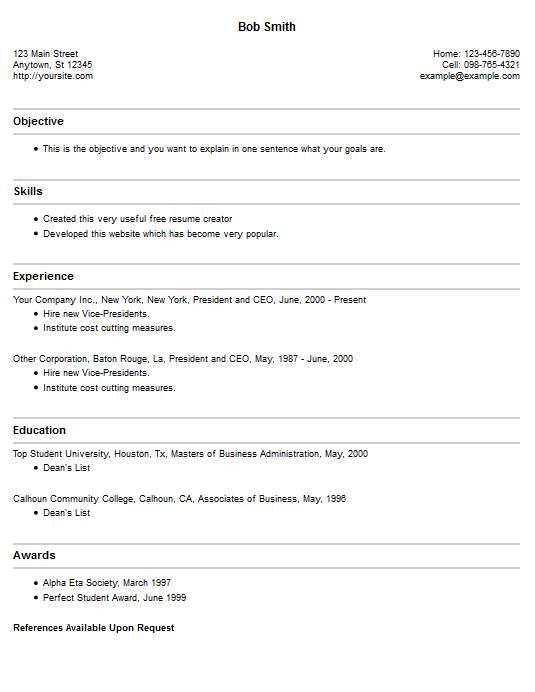 Obtain this style from our free resume creator.